The crackup at the Museum of Contemporary Art (MOCA) in Los Angeles—with glitz-blitz director Jeffrey Deitch on the ropes and famous artists resigning from the board as fast as you can say John-Baldessari-Barbara-Kruger-Ed-Ruscha—is a fascination. The fascination has nothing to do with what Deitch has actually done. His decision to mount shows dedicated to graffiti and disco and to encourage the resignation of Paul Schimmel, a widely respected curator, are exactly what I would have expected from Deitch, who only two years ago was operating Deitch Projects in New York, a commercial gallery that featured skateboard culture and a methamphetamine lab. What is fascinating about the MOCA mess is how many people are saying: “Enough!” I would not have predicted that kind of reaction, for the simple reason that all Deitch has been doing is what a lot of other people in the contemporary museum world have been doing. He just executes the same moves with a slightly sharper attack. Could it be that we have arrived at a moment of truth? Let’s leave aside all the gory details of the MOCA story. Too much has been written about MOCA’s perilous financial state, the influence of art mogul Eli Broad, and Deitch’s particular odyssey from financial advisor to art dealer to museum director. Museums are always in need of money, the super rich are always throwing their weight around, and changing one’s professional hat, as Deitch has done, is not a sin. MOCA, Deitch, and Broad are part of a much larger catastrophe, a catastrophe that began in the last years of the last century, when Thomas Krens mounted a show at the Guggenheim in New York called “The Art of the Motorcycle.” Krens filled the ramp of Frank Lloyd Wright’s great rotunda with motorcycles, and mused at the press preview that he might or might not ride his own bike up the ramp. Don’t get me wrong. Motorcycles are beautiful. But “The Art of the Motorcycle” was not really about motorcycles. Krens was telling the world that all cultural institutions are pop culture institutions. He was a populist demagogue with an Upper East Side pulpit. He was preaching to the Wall Street types who were hankering for some cultural glamour, telling them it didn’t matter if they didn’t know or care what distinguished a Mondrian from a Kandinsky. Krens has been swept aside. But his message—make it dumb and then make it dumber—has been resonating around the world, from the Turbine Hall of Tate Modern to the Jeff Koons show on the roof of the Metropolitan Museum of Art to the Takashi Murakami retrospective at the Brooklyn Museum to Jeffrey Deitch’s tenure at MOCA. The question is not pop culture versus high culture. We live in a world where there are many opportunities to experience pop culture and many fewer opportunities to experience painting and sculpture. In a wealthy society—and recession or no, this remains a wealthy society—why can’t there be a place dedicated to Mondrian, Kandinsky, Rothko, and Pollock? Is that such a sin? Deitch may have overplayed his hand. That sometimes happens when an egotist runs amok in a museum with a weak institutional culture. In the end, however, Deitch is no more than a symptom, one of the malign forces that emerged from the Pandora’s Box that Rauschenberg opened when he announced that he wanted to work in the gap between art and life. For years now, people who ought to have known better have been trying to make the best of what amounts to a compromise position. The museum has not been redefined so much as it has been disassembled, its coherence shattered as curators, administrators, and trustees grapple with the insoluble problem of operating in that nowhereland between art and life. Everything becomes the justification for everything else. The presence in the museum of Koons and Murakami is justified by relating their work to a taste for popular culture that goes back to such rock solid modern classics as Manet and Picasso. But Koons and Murakami—to the extent that they’ve learned most of what they know from Kmart and comic books—are also used to ratify Manet and Picasso, to give works that some believe are in danger of appearing superannuated a little street cred. 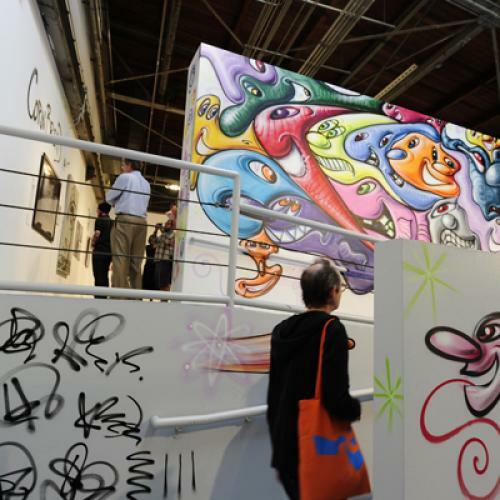 And once you’ve embraced Kmart and comic books, why not Deitch’s shows dedicated to skateboards and graffiti? Of course I’m simplifying here. But there comes a time when we need to cut through the high falutin’ intellectual mind games that were featured in “High and Low: Modern Art and Popular Culture,” the landmark 1990 show at the Museum of Modern Art. Sometimes life is life and art is art. Why must everything always be mixed up? Why must it always be high and low? Why is there such embarrassment about believing in high culture, not as one side of an equation but as an equation in and of itself? (Why, for that matter, is there such embarrassment about loving popular culture on its own terms? I do.) When Deitch’s MOCA appointment was originally announced, anybody who dared to raise a question was dismissed as an old fart. Now, two years later, the old farts turn out to include such undeniably hip (albeit older) artists as John Baldessari, Barbara Kruger, and Ed Ruscha. Let me make myself perfectly clear. I do not like Baldessari’s and Kruger’s work at all, and I don’t like Ruscha’s much better. But their resignations from the board of MOCA are a fascination. Although I cannot speak for these artists, I think I know where they’re coming from. Baldessari, Kruger, and Ruscha are all, in their different ways, connoisseurs of pop culture and pop experience. But they are students of pop life who filter those experiences through ideas about form, space, sign, and symbol that are the purview of visual artists, not of the culture at large. What they now find themselves confronting is a man at the helm of MOCA who does not care about form or space or sign or symbol, at least not in the way that anybody who really cares about art does. The people who wanted to believe that “The Art of the Motorcycle” was just the thing for the Guggenheim spoke of the motorcycles as beautiful forms, beautiful symbols. And so they are. But the form of a motorcycle is not the form of a Mondrian. And although the world has room for both kinds of form, they do not necessarily belong in the same place. I remember thinking that 14 years ago, on my way home from the press preview for “The Art of the Motorcycle.” Apparently a lot of people are thinking similar thoughts right now in Los Angeles. More power to them.